Most arguments can be settled over a couple beers. That is, of course, unless the beer industry is spearheading the offensive. 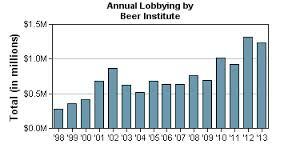 The Chicago Tribune has the story of how beer lobbyists have started a fight with Wall Street over an aluminum market rigged to line the pockets of big banks. As the Tribune explains, the London Metal Exchange runs a very complicated aluminum market worldwide. It adds that “Metal users have complained for years about banks’ and trading firms’ role in the London Metal Exchange’s warehouse system, arguing that storage owners create bottlenecks and artificially raise the prices they pay for metals like aluminum,” as well as creating lengthy waiting periods for acquisition. Their complaints fell on deaf ears until representatives from the Beer Institute, MillerCoors, the American Beverage Association and others met with staffers at the Commodity Futures Trading Commission. This meeting would beget an investigation co-opted by the Department of Justice that eventually brought about rule changes meant to expedite the process for metal users trying to get hold of aluminum. A spokeswoman for the Beer Institute said the rule changes were a “move in the right direction” but “further reform” is necessary. While lobbyists with MillerCoors fight for better access to aluminum, former employees of the company are continuing to look for work in the industry a month after the beer giant cut 360 jobs, fired 200 salaried employees and eliminated another 160 unfilled positions.